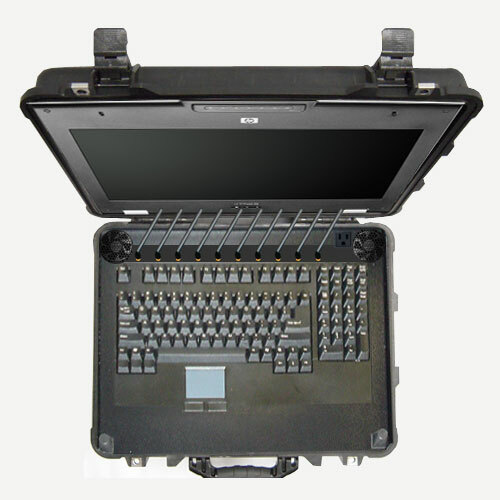 Delivering the acquisition of sensitive communications, the Cellular Intercept CC2800X1 is a robust and compact solution for Law Enforcement and Government Agency users. With its built in LCD Graphic User Interface and the rack-style panel with input touchpad - keyboard, high performance features are also part of this Cellular Intercept, making it an excellent mobile and stationary COMINT gathering system. What makes this Cellular Intercept stand out among the CC2800 Series? In addition to its transportable construction, the increased Channel capability is commendable when dealing with many interception variable. This Cellular Intercept can manage areas congested with hundreds upon hundreds of cellular subscribers ; its scalability from 16 Channels to 32 Channels is taken into account when processing at higher speed rates of large volumes of intercepted communications. The support features for this cellular interceptor and all other CC2800 Cellular Intercept models include Network Analysis, Remote Diagnostics, and the new Self Learning Mode. These dynamic features contribute to the ease of operation for all user skill levels, making the CC2800X1 the most advanced Communications Intelligence gathering system to date. For more information on the Cellular Intercept functionality or performance factors, you may Contact Us for documentation on our systems, read how our Cellular Intercept compares to other competitors, or visit us for a Demonstration.